Bangladesh is characterised by high unemployment among the youth population, particularly the educated youth. But, the high proportion of youth in the population offers what is called demographic dividend, which may continue in the process of the country’s demographic transition for about two decades more, after which the opportunity will begin to fade away fast. Hence, it is urgent that the young people are properly trained and facilitated to engage in economic activities. Wage employment opportunities may not come fast enough to make a significant impact on the pool of youth unemployment and the two million or so joining the labour force every year. Therefore, all avenues, viz., wage and self-employment, enterprise development and foreign employment, must all be actively promoted. A major theme of the ongoing 7th Five Year Plan (FYP 2016-20) is boosting economic growth and reducing poverty by empowering people through creation of more employment opportunities across the country. But, the momentum in job creation in Bangladesh has slowed in recent years despite the country’s robust economic growth and different measures taken by both public and private sectors. Using traditional technology, outdated management practices, lack of focus on entrepreneurship development and low skills of the workforce contribute to the creation of generally low quality jobs in Bangladesh as employment expands. In fact, increasing mechanization in agriculture is limiting the scope of employment creation in the sector. The worsening climate change is another negative in the context of economic expansion and employment creation. Actually, Bangladesh suffers from widespread environmental degradation, with climate change impacts at the forefront. Under the circumstances, one particular area of regular employment creation is the micro, small and medium enterprise (MSME) sub-sectors. Entrepreneurship development calls for entrepreneurship skill development, among relevant aspects and facilities. 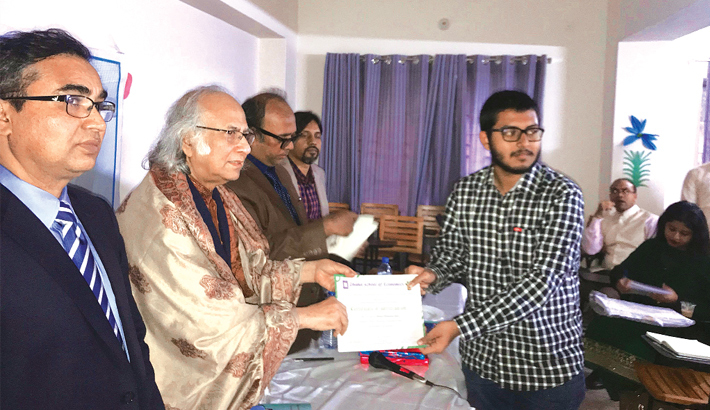 In this context, Dhaka School of Economics (DScE) has been conducting post-graduate diploma and masters degree programme to train potential entrepreneurs and enterprise promoters and facilitators. To sensitise the needs of strengthening entrepreneurship development initiatives in Bangladesh, the DScE organised a two-day exposition event titled “First International Entrepreneurial Expo, Summit and Elevator Pitch” on 18-19 January 2019. The programme focused on entrepreneur elevator pitch, young entrepreneurs stalls, seminars, poster presentations, mind mapping, discussions, and opportunities of access to finance and entrepreneurship as an alternative to job seeking. Entrepreneurship development with special emphasis on new enterprise creation, women entrepreneurship development and enhancement of access to formal financial system by MSMEs are at the forefront of the DScE initiatives. Entrepreneurship and innovation are among the key determinants of growth and development performance. In both respects, there is limited forward move in Bangladesh. Hence, it is crucial that entrepreneurship development is promoted and innovations encouraged and facilitated in the country. Two important sectors in this regard are manufacturing and services for helping accelerate the growth of businesses and employment opportunities. The DScE will continue its efforts to promote entrepreneurship through innovative educational and related programmes. Hopefully, other public and private sector educational institutions will take similar initiatives.